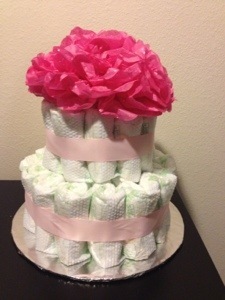 My signature baby shower gift is a diaper cake and a box of diapers. It’s so personal and has WOW factor. I haven’t met a mother-to-be that hasn’t absolutely loved her gift. Step by step directions here. I keep mine to two layers for a couple of reasons. First, the mother-to-be has to undue everything you create. Secondly, the cellphone I wrap it in fits nicely around this cake form with 2 layers. This entry was posted in Uncategorized and tagged Baby shower, diaper cake, DIY on February 26, 2013 by katzcreates.